Uses of Geographic Information Systems (GIS) at Tutor/Mentor Connection and Tutor/Mentor Institute, LLC!! Tutor/Mentor Connection GIS Project Overview!! Program Locator not connecting to Google maps, as of Aug 3, 2018. Thus site not working. Seeking help. Upgrades needed on technology features, census data, political boundaries, etc. This Ning page shows how interns are working with us to create some of these presentations. Many others are building mapping platforms. Visit the MappingforJustice blog to see stories showing map platforms and links to a library with even more examples. View this video to see innovate source to help journalists create map. In two sections below I've used this graphic to show what we've built and what still needs to be built. It all needs to be constantly updated and a marketing/PR/training budget needs to be found to make people aware and teach them to use this. If we can tie a raising money component to the portal and show where the money is going we can build motivation for users by helping them gain needed resources. Using maps to build capacity of all tutor/mentor programs in a geographic region. Visit this page to learn more and help develop this idea. The T/MC use of Geographic Information Systems demonstrates how a GIS based knowledge library can be used in an on-going campaign intended to draw more consistent attention to the social issues of any geographic area. We use our maps to draw attention, and resources, to more than 170 different volunteer-based tutor/mentor programs in the Chicago region. We started doing this work in 1993 and have been collecting information about Chicago area tutoring and/or mentoring programs. Since then we have created dozens of map stories that draw volunteers and donors into neighborhoods featured in news media that highlight the negatives outcomes of poverty (shootings, poor schools, drugs, gangs, etc. By following the media with Map stories, we aim to use the publicity generated by negative news as part of an advertising campaign intended to draw more consistent attention to tutor/mentor programs in these neighborhoods, and to our web sites where we provide information on why tutor/mentor programs are needed and a program locator database, that shows which programs are in what neighborhoods. This will lead to a more consistent flow of volunteers, donors and other resources directly to programs in these areas. By creating an internet based program locator, we enable students, parents, business leaders, as well as youth in our own Cabrini Connections program, to create map stories that Tell the Rest of the Story, and through our conferences and other networking, we aim to teach other programs to use this process, to help draw attention to the tutor/mentor programs in their own zip code. Media Stories - Credibility of Project Goals !! Chicago Tribune, 10/15/15 - Use of Interactive Maps in Violence Prevention Strategy. See story. We have built a battleship. Now we need a crew and resources to operate it. During 2008-09 the Tutor/Mentor Connection has used funds donated in 2007 to create an Internet based GIS database that we will integrate into a unique marketing and public awareness process aimed to support the growth of volunteer-based tutor/mentor programs in every poverty neighborhood of Chicago and its suburbs. We launched the new portal on the http://www.tutormentorprogramlocator.net address in April 2009. Now we need to find dollars, and volunteers, to help us continue to upgrade the technology, collect and organize the data, and do the marketing and training that increases the number of people who use this tool. One of the possible applications of our GIS will be to teach young people to be map makers/writers, so that they are using their voice and their talent as part of this process. We expect that the Program Locator will be used by people throughout the Chicago region, and will be duplicated by tutor/mentor leaders in multiple cities of the US and the world. The T/MC uses of GIS maps will also stimulate innovation and duplication in other social sectors where there is a need for quality services in an entire geographic region, rather than in just a few high profile locations of a region. We describe our uses of maps in a Tutor/Mentor Institute section at http://www.tutormentorexchange.net/mapping-the-programs. Our vision is that the Tutor/Mentor Connection's GIS Program Locator will become a tool that anyone can use to be a leader and to mobilize support for volunteer-based tutor/mentor programs located in high poverty neighborhoods, which is where our maps will demonstrate that such programs are most needed. It will also be a model that media will begin to use, just like they use maps in weather reports, to draw attention to neighborhoods with incidents caused by urban poverty. 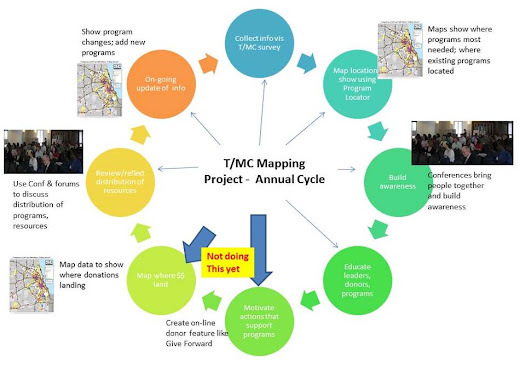 A core component of the Tutor/Mentor Connection (T/MC) strategy is its use of Interactive databases, the Internet, and Geographic Information Systems (GIS) to draw volunteers and donors to tutor/mentor programs in every poverty neighborhood of Chicago. 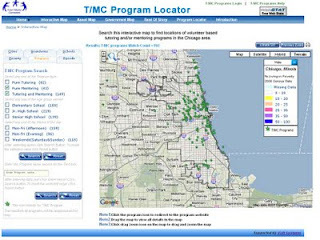 Since 1993 the T/MC has been piloting the use of GIS maps to show where poverty is most concentrated in Chicago, where existing tutor/mentor programs are located, and what churches, businesses; universities and hospitals are in the same neighborhood and could be more involved as partners in building and sustaining comprehensive mentoring-to-career programs. The T/MC began putting its strategy on the Internet in 1998 and its sites have been visited by more than 150,000 people in the years since. A search of Google for "tutor mentor" bring the web site up first among more than 2 million listings. This use of GIS has been recognized in articles published in ARC NEWS (1998), URISA NEWS (Dec.1999) and PolicyLink (2001). In 2004 the T/MC's use of GIS was nominated for a Global: Ideas Bank Social Innovations Award. A June 2009 article in YouthToday includes a profile of the T/MC's use of maps. The work done from 1994 to 2007 has been supported primarily by volunteers, thus the project has grown slowly and has not yet reached its full potential. With funding provided in 2007, the T/MC has updated its desktop GIS capacity and has created a searchable GIS/database. We now seek volunteers and funding that will enable T/MC to continue to add features and manage the Interactive Program Locator. We also need funds/staff to update the Chicago tutor/mentor programs data on a more continuous basis, and to create weekly maps/stories that follow media headlines, and draw volunteers and donors to tutor/mentor programs in the areas where poverty leads to poor school, gangs, youth-on-youth violence and other and a tremendous cost to society. In addition, we need funds to publicize and build awareness of this resource, so more people find it and learn to use it. If we can find sources of consistent revenue, we will not only be able to develop and provide on-going support to the technology aspects of this project, but we will also have the staff needed to maintain the quality of the data, and to teach young adults to create weekly REST OF THE STORY articles that use media headlines as advertising intended to turn bad news into a flow of volunteers and donors into neighborhoods where the bad news took place. As more and more people in different cities, and different social benefit sectors see the uses of this project, the T/MC will be able to generate revenue from selling its GIS services on a consulting basis, as part of its strategy for sustaining this service beyond the period of the grant. What unmet need does the T/MC GIS Project answer?!! The GIS is a tool that we integrate with other marketing strategies to provide more consistent leadership and public attention to tutor/mentor programs than any public leader is able to provide, and than any private sector leader is currently providing. Using maps to show where poverty and poorly performing schools are located, and to show what tutor/mentor programs exist in specific neighborhoods, we can quickly see that many neighborhoods with high poverty have few or no programs, or no programs serving older youth. Using THE REST OF THE STORY concept, we aim to draw more consistent attention to the existing programs, so they can get the resources they need to constantly improve, while drawing attention to neighborhoods without programs, so that business, church, college and hospital partners come forward to create new programs to fill these voids. The GIS project creates an advertising type visibility, and distributes attention to all neighborhoods with high poverty. Instead of a few high profile programs or a few high profile neighborhoods getting attention most of the time, this service will provide more consistent attention to all of the neighborhoods where people live in poverty or near poorly performing schools. The T/MC will provide four services that are not usually available to tutor/mentor programs, and to those who support these programs as volunteers or donors!! This graphic represents the vision of Dan Bassill and the Tutor/Mentor Connection (T/MC) which began to pilot a use of maps in 1993. This shows a cycle of collecting information about non-school, volunteer-based tutor/mentor programs operating in the Chicago region, and using maps to show where these programs are most needed, based on poverty, poorly performing schools, violence, etc. The strategy is based on what big companies like Sears, WalMart, Bank of America, etc do to support thousands of branch locations with central organizing, planning and advertising strategies. a) No one else in Chicago maintains a master database of tutor/mentor programs, or shares it with the level of detail, or with a GIS interface, the way the T/MC does. By providing this information on the Internet, the T/MC provides information that is used by parents, social workers, teachers, volunteers, donors and anyone else interested in creating non-school learning supports for inner city kids. A growing number of organizations in Chicago and beyond are beginning to use maps as tools to help people locate programs. See list. b)**While there are growing numbers of GIS platforms available (see this concept map), few are adding layers of information on businesses, faith groups, universities, hospitals, etc, which are assets, who could be working together to support growth of needed youth and family support programs within specific zip codes and community areas, which is a feature and purpose of the Tutor/Mentor Program Locator. c) **No one is yet using the map platform as a fund raising tool, intending to draw resources to programs in different zip codes, and intending to capture data to show unequal levels of funding. Some are beginning to report funding by category, by zip code, such as this example. d) What makes T/MC and T/MI difference? Intermediaries, such as MENTOR, The National Mentoring Partnership, and local partnerships, such as Illinois Mentoring Partnership, focus on the act of mentoring, and ways to support effective mentoring in existing programs. Tutor/Mentor Connection and Tutor/Mentor Institute, LLC focus on strategies that make mentor-rich, long-term programs available in all high poverty neighborhoods of big cities like Chicago, and ways volunteers in these programs do more to help kids to careers and families overcome poverty. Mentoring Partnerships don't focus specifically on areas of high poverty, since kids from many backgrounds benefit from mentors. T/MC focuses on big city poverty. e) The T/MC seeks to reverse the way non profits are funded. Instead of every non profit constantly seeking resources, we want to adopt business advertising models, in which educated consumers are shopping the T/MC maps and database to locate programs they want to support with time, dollars and money. In this concept, the web site of a program is its grant proposal. This is a concept ppt for what a funding portal might look like and how maps would be integrated into it. Not every tutor/mentor program is equally good at generating public attention for their organization. This, while creating the Program Locator database is important, it is equally important that we create an on-going public awareness campaign that draws millions of viewers to the Program Locator, who become volunteers, donors, advocates, etc., supporting Cabrini Connections, and programs in every other high poverty zip code of the city and suburbs. d) The T/MC public awareness effort is intended to increase the flow of critical resources directly to tutor/mentor programs in every neighborhood. We aim to teach donors and volunteers to first choose what zip code they want to support, then use the GIS to show them what programs already exist in those zip codes. Such a tool can help leaders identify underserved neighborhoods, and potential partners who could be working together to create new programs. The T/MC is recruiting business leaders who use their own resources to draw volunteers and donors to tutor/mentor programs. The SunTimes Abraham Lincoln Marovitz Lawyers Lend A Hand to Youth Program at the Chicago Bar Association is an example. LAH raises visibility in the legal community and raises money that it distributes as grants to tutor/mentor programs. In November 2006 the Chicago Sun times made a $2 million donation to the LAH which resulted in grants of $240,000 in 2007 and $217,000 in 2008 to tutor/mentor programs in Chicago (one grant of $30,000 funds a staff position at the Tutor/Mentor Connection). f) Finally, the T/MC seeks to build a deeper commitment to supporting tutor/mentor programs through on-going education of volunteers and donors. T/MC maintains an extensive on-line resource library and organizes a variety of face-to-face and on-line events intended to help people find and use this information to develop strategies that lead to more and better tutor/mentor programs in more places. No one else in the Chicago region is providing this level of support to the growth of tutor/mentor programs in every neighborhood of the city, not even the Mayor. Logic behind the T/MC GIS!! A Geographic Information System (GIS) is a base map of a geographic area, with layers of information on top of it. Thus, we use a base map of Chicago, then overlay demographics showing high poverty, poorly performing schools, incidents of violence. Additional information that could be added would be concentrations of ex-offenders, public health data, unemployment data. All of these are indicators of need for mentor-rich, long-term programs like Cabrini Connections. In addition to layers showing need, we map the data we've been collecting in the Chicago Tutor/Mentor Program Locator database. We have more than 250 listings of organizations which provide various forms of volunteer-based tutoring and/or mentoring. About 175 of these are classified at "tutor/mentor" or "pure mentor" and show up on the map when you open the interactive program locator. type of program (pure mentor, pure tutor, tutor/mentor). See the PDF titled Defining Terms, to build an understanding between the differences between these three types of program. We focus on the 'tutor/mentor' category, because if expands the network of adults, and learning base, of youth who participate. time of day service is provided (school day, 3-5pm after school, evening/weekend). In big cities like Chicago the evening/weekend time frame is the only one in which workplace volunteers are likely to make long-term connections with kids in structured programs like Cabrini Connections. While 3-5pm programs are needed in every high poverty neighborhood, so are programs that can attract this expanded network of volunteers. This information can be sorted by zip code in our database, and with an interactive GIS, users can zoom from the city level, to the neighborhood or zip code level. While we can do this from the office GIS we're building at the Tutor/Mentor Center in Chicago, we're not able to provide this level of support to all of the potential users of this system. This concept map shows many different data platforms. One of those, added in January 2018, is a Regional Housing Solutions dashboard, built by the Chicago Metropolitan Agency for Planning (CMAP). What is unique about this is the way it supports a discussion of issues and shows communities in the region who are similar and could be collaborating and/or exchanging ideas. In concept, this is the type of support tool the Tutor/Mentor Connection has been trying to build for 20 years. How to use the Program Locator? This animated introduction shows the features of the new Program Locator. We also have created a "help desk" overview to help users learn how to use this resource. Another pdf shows how to add information about new programs, or edit existing information. Here is a blog article illustrating how to create your own maps. History and stages of growth !! The T/MC started using GIS mapping to show locations of tutor/mentor programs in 1993. It moved its program database to the Internet in 1998 and then launched its first searchable database in 2003. The http://mappingforjustice.blogspot.com map library was launched in January 2008 and the new interactive program locator was launched in April 2009. By placing this information on its web site, the T/MC is making it possible for any volunteer, donor, or parent in Chicago to query the system and access information about existing tutor/mentor programs. By creating such a service and making it available to others at low, or no cost, the T/MC is enabling others to benefit from such a system without paying the full cost of creating and maintaining it. Since 2001 we've hosted a GIS group at Yahoo.com where we've discussed what we're trying to do and shared ideas with others. You can follow the progress of rebuilding our map capacity at http://mappingforjustice.blogspot.com and in the articles on the Tutor/Mentor Blog. The GIS project will have another benefit, as well. 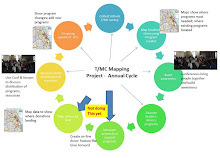 Because the maps must be created, the T/MC seeks to create a Youth Apprentice Learning Program, engaging 7th to 12th grade teens who participate in the Cabrini Connections program, and age 17 to age 25 alumni who have participated for one or more years since 1993. Such a program will teach young people to create GIS maps, web pages, videos and art, while at the same time will teach them to uses these skills as tools in building public involvement in tutoring/mentoring programs. By teaching teens and young adults to use technology to solve problems we empower them with skills they can use throughout their lives, while enlisting them in the T/MC's campaign to increase the availability of tutor/mentor programs throughout the region. A model for what we seek to create is Hopeworks in Camdon. This is a program where youth are learning to create map analysis reports for the Camdon, New Jersey community, using a sophisticated GIS platform installed at their headquarters. We seek to create a similar platform, and use it to update the library of maps we first created between 1995 and 1998. These show poverty levels, locations of poorly performing schools, locations of existing tutor/mentor programs, and locations of businesses, churches, universities, etc. in a neighborhood. Copies of these map views are used for presentations, marketing, web libraries, etc. The internet version would have these same features, but would be available in an interactive format to users. Building Public Awareness and Involvement in Tutor/Mentor Programs. Once the GIS Platform is in place, and we have volunteers or staff who are building the map library, we will begin to implement "the REST OF THE NEWS" strategy. We will follow news reports in daily papers and on TV, and create map views that show where a story took place, and the demographics that caused such an event to happen. We will also show existing tutor/mentor programs in the area, or a lack of programs, if that is the case. The REST OF THE STORY map/analysis will be communicated via our blogs and a map gallery on the internet. Samples will be sent to media to use as follow ups to news stories they are reporting. This is a key part of the T/MC strategy because we do not expect to ever have significant advertising dollars needed to draw daily attention to tutor/mentor programs. However, since the media devote front page headlines to negative news, costing as much as $300,000 or more for a full page, we seek to build off of the public awareness created by negative news, to point to ways volunteers and donors can get involved to turn the bad news into good news. This map was created using the Interactive Program Locator. Then posted into a blog article. We now have the capacity to produce map analysis reports as we need them. As we find the dollars to support our GIS staff, and volunteers to supplement this we can build maps on a regular basis following news reports. We can also begin to teach students to do this work, as part of their own service learning, communications, and leadership training. When students at hundreds of high schools and volunteers at dozens of companies and faith groups begin to create their own maps and advocacy, we will have built a distributed leadership and ownership for the Tutor/Mentor Connection, which will sustain and expand well into the future, no longer dependent on any single leader. Can you our your company or foundation be the benefactor that provides $100,000 per year for the next five years for us to support this vision, and this strategy? Contact the T/MC at ten.knilhtrae|2rotnemrotut#ten.knilhtrae|2rotnemrotut if you an help.